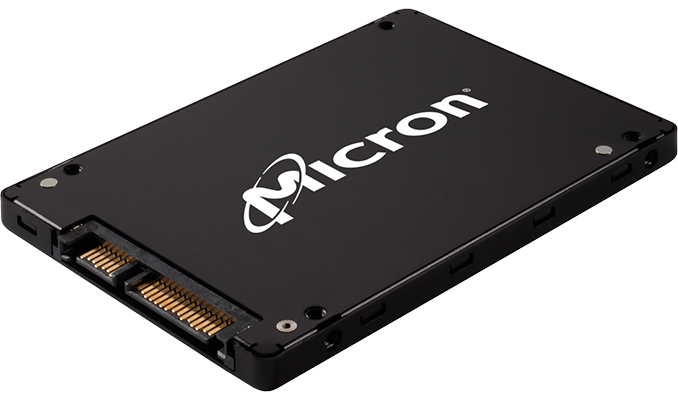 Micron this week published its financial results for the third quarter of its fiscal 2018 (ended on May 31), which also included an update concerning its non-volatile memory products and projects. The company confirmed that it is on track to start volume shipments of 96-layer 3D NAND chips (3rd Gen 3D NAND) in the second half of calendar 2018, and said that development of its 4th Gen 3D NAND is proceeding as planned without participation of Intel. At the same time, Micron indicated that sales of its 3D XPoint memory were well below expectations, which hurt the company financially because its fab remained underutilized. 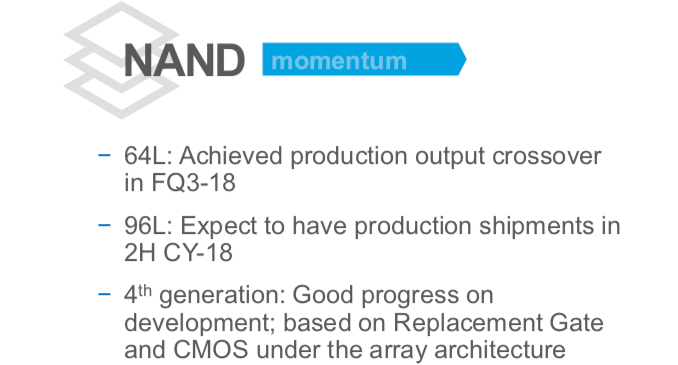 At present Micron is ramping up production of its 64-layer 3D TLC NAND memory (2nd Gen 3D NAND) and last quarter it achieved production output crossover with other types of NAND the company manufactures. This is particularly good news for Micron because 64-layer 3D NAND devices are significantly more cost-efficient in terms of cost per bit compared to 32-layer 3D NAND memory, which allows Micron to earn more. In fact, 64-layer 3D NAND enabled Micron to launch two major products. First, the company released its 2.5-inch SATA 5200 ECO SSDs with up to 7.68 TB capacity in January targeting mainstream servers. 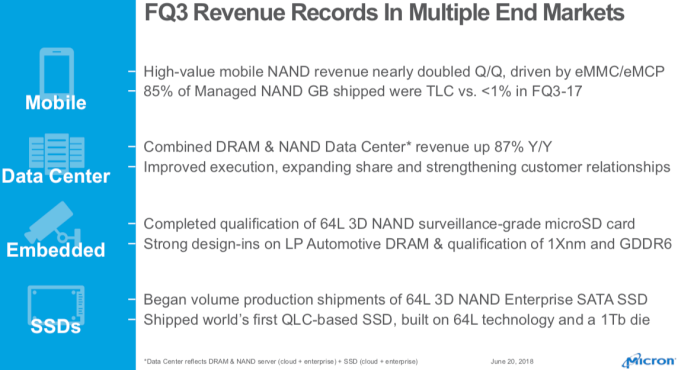 Second, 64-layer 3D QLC memory enabled Micron to compete for nearline storage segment with its 5210 ION drives launched back in May. 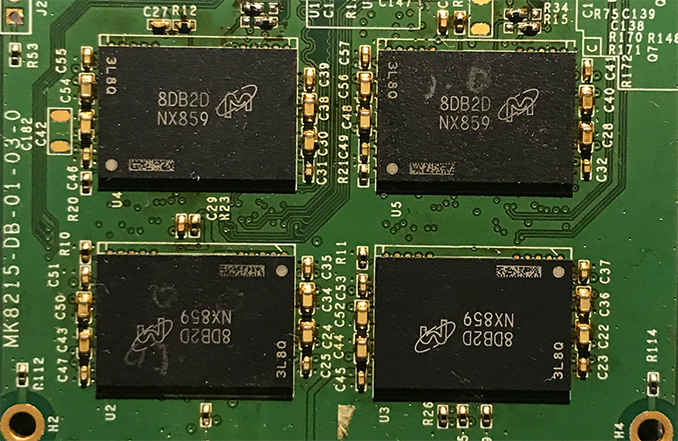 Earlier this month we reported that at least two developers of SSD controllers have qualified Micron’s 96-layer 3D TLC NAND memory for SSDs. During the conference call, Micron confirmed that it was on track to ship its 3rd Gen 3D NAND in volumes for commercial products in the second half of calendar 2018. It is not clear whether the initial batches of such memory will be used for various removable storage solutions (memory cards, USB flash drives, etc.) as it happens usually, but it is evident that Micron’s 96-layer 3D NAND is making a good progress with designers of SSD controllers. Maxio Technology intends to use Micron’s 3D TLC B27A memory for inexpensive drives based on its MAS0902A-B2C DRAM-less controller, whereas Silicon Motion is so confident of this memory that it has qualified it with its top-of-the-range SM2262EN controller for high-performance SSDs. 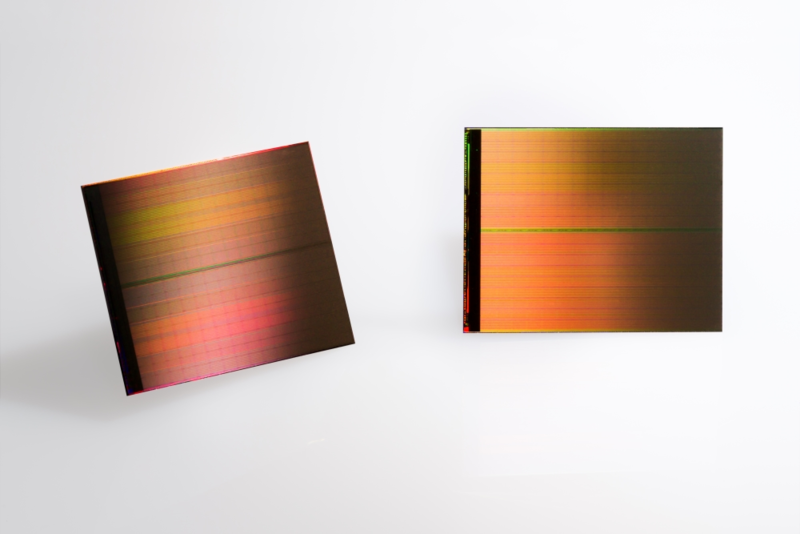 “We still expect to have production shipments on our 96-layer 3D NAND in the second half of calendar year 2018,” said Sanjay Mehrotra, CEO of Micron. Moving on, we have Micron’s 4th Gen 3D NAND, which is developed solely by Micron without any input from Intel. Since the tech is set to hit production in the coming quarters, its development is well underway at this point. According to CEO of Micron, development of the company’s 3D NAND memory with more than 96 active layers (e.g., 128 layers, or more) is progressing well. 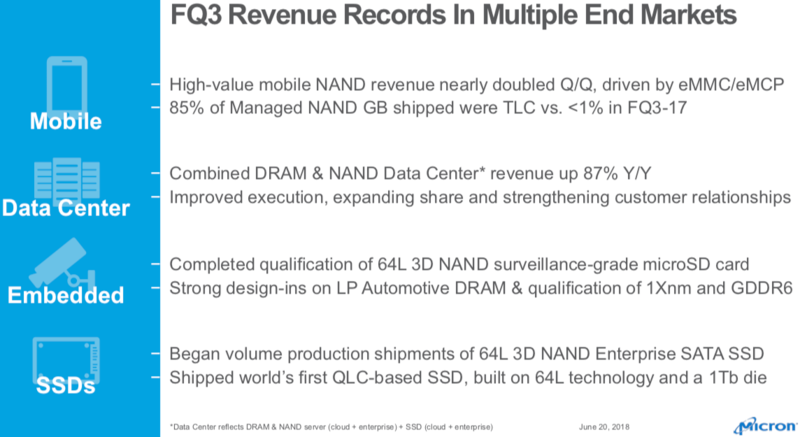 Meanwhile, the only thing that the company discloses about its 4th Gen 3D NAND right now is that it will keep using the CMOS under the array architecture that enabled IMFT to build the smallest 3D NAND memory devices in the industry, as well as the “novel replacement gate” technology. “We are also making good progress on the development of our fourth-generation 3D NAND, which will utilize our novel replacement gate technology,” said Mr. Mehrotra. Samsung has used its gate replacement process for its V-NAND for years now, but Samsung uses the technique alongside its charge trap cells. By contrast, IMFT has used its floating gate technology for 3D NAND, something that other makers decided not to do. It is unclear whether adoption of gate replacement means that Micron will move on to charge trap (like the rest of the industry, including Samsung, SK Hynix, and Toshiba/Western Digital), or will keep using floating gates. Technology experts from Imec recently predicted that Micron will eventually have to move from floating gates based on polysilicon-oxide stack to charge trap cells based on oxide-nitride, but Micron yet has to confirm this itself. Micron did not have to use string stacking technique for its commercial 64-layer 3D NAND, even though it reportedly demonstrated a 64-layer 3D NAND chip by stringing two 32-layer devices together a couple of years ago. Meanwhile chances are that it will have to use the technique with its subsequent generations of 3D NAND — produce a full 3D NAND stack, form the channel, add an insulating layer, then build a new 3D NAND stack on top. The big question is whether string stacking is set to be used for 96-layer, 128-layer, or even more complex 3D NAND devices; but it is evident that 3D NAND manufacturing is getting more complex as the number of layers increases. 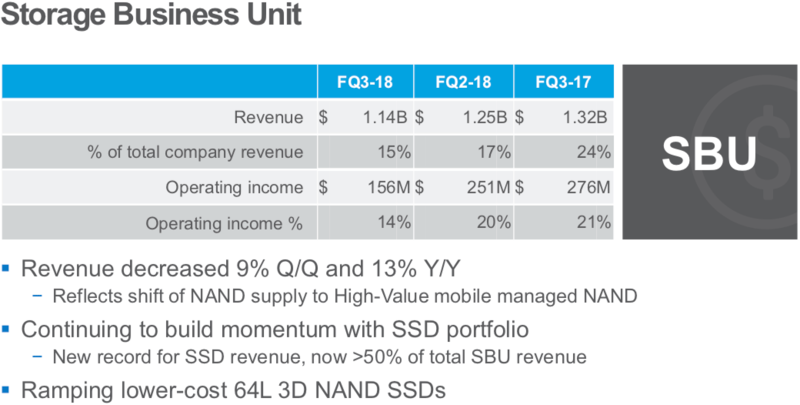 While sales of Micron’s SSDs are growing (and currently account for 50% of Micron’s storage business revenue, or $507 million) and the company continues to shift to high-value specialized NAND products from selling raw NAND chips, shipments of 3D XPoint are below expectations. According to Micron, it sold “very little” 3D XPoint memory to its unnamed parter (almost certainly Intel) during its Q3 FY2018. As our readers are well aware, 3D XPoint was jointly developed by Intel and Micron (IMFT). At present, this memory is produced exclusively at IMFT’s fab in Lehi, Utah, co-owned by Micron and Intel (who control 51% and 49% stakes, respectively). Late last year the two companies actually expanded the manufacturing complex with a new building called B60, which is equipped specifically to produce 3D XPoint. Meanwhile, the new type of memory is currently used only by Intel itself for Optane Memory caching SSDs aimed at mainstream PCs as well as Optane high-performance SSDs for servers and workstations. Micron is developing its own 3D XPoint-based products (which will be sold under the QuantX brand), but they are expected to launch only in late calendar 2019 with meaningful volumes/revenue sometime in 2020. Since Micron does not consume any 3D XPoint for retail purposes, it needs to sell virtually all the output it has from the Lehi fab to Intel, otherwise Micron needs to register an underutilization charge (a fab that does not run wafers still costs a lot of money), which is exactly what happened last quarter. As it turns out, Intel is not consuming Micron’s entire share too, and the latter expects this situation to persist in the ongoing quarter, or even quarters. In fact, Micron even models a situation when Intel does not buy any of its 3D XPoint memory. From Intel’s point of view, demand for 3D XPoint is actually higher than it can produce since it still needs to buy some wafers from Micron. Furthermore, as yields of 3D XPoint improve, Intel actually gets more good 3D XPoint dies from its 49% portion of the Lehi fab output. It is unknown whether Intel had actually planned to buy 3D XPoint memory from Micron, or if their original plans were to rely solely on their share and expecting Micron to use up their own share on their own products. Nonetheless, demand for the current Optane product lineup from Intel is only high enough to consume “Intel’s” memory and Micron does not expect demand to increase at least this quarter. Demand for 3D XPoint from Intel may increase in the coming quarters because the company is gradually expanding its Optane lineup. In March the company demonstrated its Optane M.2 enterprise SSD, then in May it announced its Optane SSD 905P aimed at enthusiasts and featuring RGB lighting, then in late May the firm showcased its Optane DC Persistent Memory (Apache Pass) modules featuring 128 GB – 512 GB capacities and aimed at next-generation servers. Once Intel launches these products and ramps up their production, it may need additional 128 Gb 3D XPoint memory chips to fulfill demand for these devices, and this is when Micron may get a bigger piece of the Optane pie. Meanwhile, it should be noted that the Optane M.2 and the Optane 905P are essentially niche products that may not get overly popular. By contrast, the Optane DC Persistent Memory requires validation and qualification from server OEMs (which may take some time) and then the ramp up of a new server platform will take several more quarters. Micron is confident that there is a bright future ahead for 3D XPoint memory in general. However, at present it suffers from underutilization of its 3D XPoint production lines. “We are excited about the potential for 3D XPoint technology to create a new tier of memory and storage between DRAM and NAND flash,” said Mr. Mehrotra. "From Intel’s point of view, demand for 3D XPoint is actually higher than it can produce since it still needs to buy some wafers from Micron. " "Sales of 3D XPoint Disappoint"
Intel could buy from Optane from Micron shares of capacity. Intel's Optane product demand is outstripping supply, but decided to only buy little from Micron. Just more Intel price manipulation here. Basically they (Intel) have a 100% oversupply, but are reporting it as "demand is meeting our outstripping supply" because they would rather not buy Micron's share of xpoint wafers and use those, because it hurts profit margins.